Amid rising unrest, President Nicholas Maduro expels American consulate officials - the second group to be expelled in four months. Venezuelan President Nicolas Maduro has announced in a national TV booadcast that he will be expelling three American consulate officials, as his government faces unprecedented protests by opposition groups. He described the unnamed US officials as "a group of US functionaries who are in the universities." Maduro, who has repeatedly cited a shadowy foreign conspiracy and "corrupt businessmen" as standing behind those opposed to his administration, claimed the US officials were helping to stoke protests which have killed at least three people in the last week. "We've been watching them having meetings in the private universities for two months. They work in visas," he said. "Venezuela doesn't take orders from anyone!" 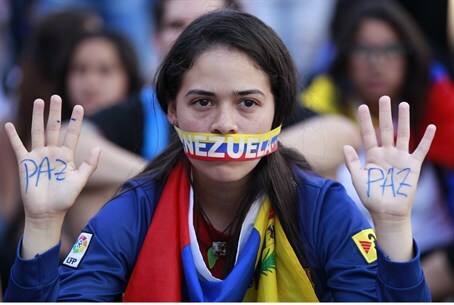 The protests come in response to Maduro's management of the country, leading Venezuela to have one of the highest murder rates in the world, the highest inflation rate in the region at 56.2% as of 2013, and systemic shortages of basic goods, according to the BBC. This marks the second time in four months that Maduro, who took power from Hugo Chavez after he died last March, has kicked US diplomats out of his country. Continuing his radical left-wing predecessor's relationship with fundamentalist Iran, the outspoken Maduro has insulted his political opponents as "heirs to Hitler" in the past, and has been frequently accused of anti-Semitism. US Secretary of State John Kerry released a statement of "concern" regarding the unrest, and in particular the arrest warrant issued for opposition head Leopoldo Lopez. "We are particularly alarmed by reports that the Venezuelan government has arrested or detained scores of anti-government protesters and issued an arrest warrant for opposition leader Leopoldo Lopez," he said. Despite the arrest warrant, Lopez, who has not been seen in public since Wednesday, has pledged to lead a peaceful demonstration tomorrow in the capital Caracas.